Named after Miguel Lopez de Legazpi, the Spanish Conquistador who colonized the archipelago and brought the whole “Las Islas Filipinas” under Spanish rule in 1565, the City of Legazpi is the capital of Albay province. It stands as the largest city in the entire Bicol region. Called the “City of Fun and Adventure”, Legazpi is situated on the Pacific coast of Albay province and comprises two districts, namely Legazpi Port and Albay District. The former is the site of a pre-colonial town named Sawangan, and the latter was the main administrative and business hub during the Spanish and American occupations. The most convenient means of getting to Legazpi is by plane and there are several local carriers with direct flights to Legazpi Domestic Airport, the busiest airport in the region, and pretty soon the Legazpi International Airport shall be operational, and promises to not only be much bigger but also much, much better in terms of service, convenience and amenities. Since Legazpi is conveniently located in Luzon, if one wishes to take the scenic route then travelling by land via bus or private vehicle will take around nine to twelve hours through rolling fields, quaint little hamlet towns and picturesque vistas with the omnipresent Mayon Volcano looming in the backdrop as you get closer to the Legazpi Grand Terminal (if by bus). MOUNT MAYON or MAYON VOLCANO. 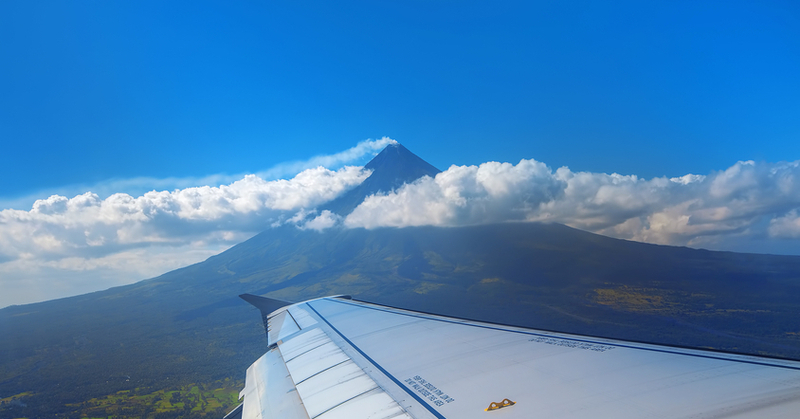 Undoubtedly the most recognized landmark on the whole Bicol Region, Mount Mayon, or Mayon Volcano, is a truly majestic sight to behold! Considered by many as having a “perfect cone”, due to its almost symmetrical conical shape, Mount Mayon towers at 8,189 feet above sea level from a base of around 10 kilometer radius and is visible to about 50 kilometers away, like a silent sentinel watching over the land. Named after a mythical heroine, DaragangMagayon, ‘beautiful lady’ in the Bicol dialect, this active volcano was first declared a national park and protected landscape on the 20th day of July way back in 1938, and eventually reclassified and renamed as Mayon Volcano Natural Park in 2000. CAGSAWA RUINS. When Mount Mayon violently erupted back in 1814, it decimated the entire area for kilometers around, burying the adjacent towns including a Franciscan church, the Cagsawa church, which lie roughly eleven kilometers away from the summit. Today the only remaining part of the church is its bell tower which stands as a mute monument to the power and fury of Mother Nature unleashed, and also as a stark reminder of the perils of living so close to an active volcano. One of the most popular tourist attractions, the Cagsawa Ruins/Bell Tower with the imposing volcano in the backdrop, form part of the most well-known and iconic scenes in the Philippines, featured prominently in postcards, ref magnets, travel books, textbooks, tourism posters and billboards, etc. MISIBIS BAY. A mere hour away from the Legazpi airport, lies an exclusive island getaway on a kilometer stretch of pristine, golden-sand beach along the southern tip of Cagraray Island in Bacacay, Albay, that caters to the jet-set privileged elite. With just 37 Asian-inspired villas with high ceilings and expansive terraces its architecture and interiors reflect a style that is all about luxury, posh and extravagance. Three pools, two exquisite restaurants, a spa to-die-for, and numerous activities including ATV dune buggy and Segway electric chariot rides, Jet Ski, Kayak, Avalon Fun Ship, wind surfing and more, one can even swim with the wondrous whale sharks of Donsol while in this earthly paradise. Guest are treated like royalty and can opt for a candle-lit dinner for two on the beach under the vast canopy of stars, or in the amphitheater with a glorious view of Albay Gulf, or breakfast atop a hill overlooking majestic Mayon Volcano. The ultra-stylish resort serves Asian cuisine fused with trademark Bicolano spices for a truly remarkable and unforgettable gastronomic experience. LIGNON HILL NATURE PARK. Known as the “Protector of Legazpi City”, Lignon Hill stands between the city and the great Mayon volcano, blocking the flow of lava in the event of an eruption, and protecting the city from catastrophe. Standing at 156 meters, the hill provides a 360 degree unobstructed view of the Mayon Volcano and the entirety of Legazpi City. Visitors are encouraged to hike from the base to the top of the hill. Once you reach the top there are souvenir shops where one can purchase handicrafts, and other souvenir items and knick knacks. For the more adventurous type, there is a zip line that is 360 meters long and rises 160 meters off the ground. Not for the faint-hearted and definitely a sure adrenalin rush provider! CATHEDRAL OF ST. GREGORY (ALBAY CATHEDRAL). Officially the Episcopal Seat of the Diocese of Legazpi, the cathedral began as a humble little wooden chapel built by Spanish missionaries, damaged during World War II, reconstructed, and eventually elevated to cathedral status at the founding of the Episcopal See of the Diocese of Legazpi, and is a well-recognized landmark in the area. PILI NUT HILLS. One of the first sights that visitors travelling by plane come upon providing a fantastic aerial view of these beautiful ”green hills”, not as symmetrical in shape to the more famous Chocolate Hills of Bohol but no less impressive and just as inviting. Called “Albay’s Best Kept Secret”, these hills are not as familiar and popular as the other tourist destinations and even some of the locals are not fully aware of it, but it is definitely worth your while to visit. EMBARCADERO. The Bicol Region’s premier urban mall, Embarcadero de Legazpi is waterfront commercial and lifestyle center fronting the main harbor of Legazpi City with a spectacular view of Mayon Volcano, crafted and created by the Philippine Economic Zone Authority (PEZA) as a Special Economic Zone to recapture the halcyon days of Spanish trade galleons docking in the port of Legazpi as the main trading post in the region. With a beaming search light atop its lighthouse for inviting the young urbanites for stylish metro-living and partying, the Celebration Plaza at the center of the mall serves as a 105-square-meter event center for fashion shows, beauty pageants and international conventions, the stylish yet surprisingly affordable Ellis Ecotel, the “Funtasea Island” indoor amusement center, and the piece-de-resistance: a 90-feet high Skywalk for that extra-special, unique, blood-pumping experience! EXPLORE THE JAPANESE TUNNEL. An L-shaped, forty meter long, seven feet deep and around three feet vertical clearance tunnel used by the Japanese forces during World War II as a stockpile for their weapons and ammunition, dug at Lignon Hill at their occupation of the city on December 12, 1941, this curious reminder of that dark period in Philippine history is said to stretch all the way to the municipal hall of the city but certain areas were buried under rubble when the Japanese were escaping the area upon the arrival of the American Liberation forces at the end of the war. Most of the relics, and especially the live ammunition, were removed from the area and stored in a different place but there are still effigies of Japanese soldiers and some relics still remain. VISIT LEGAZPI CITY ECOLOGY PARK. A 5.3-hectare park conveniently situated in the southern tip of Legazpi City, about 30 minutes away through a 15-kilometer road, designed as a natural museum of fauna and flora endemic to the country and especially in the Bicol region and home to endangered or nearly extinct plants and animals previously abundant in the archipelago. With modern amenities and conveniences such as cottages and restaurants, a lagoon for fishing or simply enjoying the aquatic life, mangroves and king crab culture area, hanging bridge, zip-line, rappelling and wall-climbing facilities and, of course, a myriad of animals and plants, this ecology park serves as a haven from the hustle and bustle of city life where family and friends can have picnics, retreats, camp-outs, seminars and even conferences in a very tranquil and serene environment fully immersed in the fantastic ecological habitat. SWIM AND RELAX AT THE SANTO DOMINGO BLACK SAND BEACHES. Distinctive and unique, black sand is the product of millions of years of natural erosion crushing and pulverizing volcanic rock into fine-textured sands of very deep ebony hue, endemic to the Bicol region and the province of Albay due to its volcanic origins, stretching along the eastern seafront, giving the beaches in the town of Bacacay, Sto Domingo a most tantalizing and wondrously exotic beauty. Perfect for moonlit romantic strolls especially on full moon nights, the beaches of Santo Domingo definitely deserves to be part of one’s itinerary. ATTEND THE MAGAYON FESTIVAL. From the legend of the mythical “Daragang Magayon”, or beautiful maiden, the annual Magayon Festival, held all throughout the merry month of May, is a celebration of everything beautiful and wonderful in Albay province: the unequivocal beauty of the countryside, the artistry and talent of its people and the enchanting splendor of Mount Mayon itself.